Not to be confused with Chest Armor. The armor pieces the character puts on are divided into three main types: the masks, the chest armor and the legs. The armor improves a character's health, defense, critical chance and speed. The armor can be purchased with silver and crystals. Some armor pieces require a certain player level to be unlocked. The best armor pieces can be bought with crystals only and do not require a minimum player level. 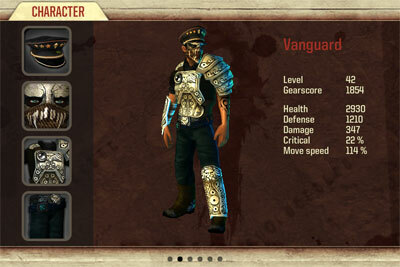 Each armor piece has its own stat for health, defense, critical chance and speed. As with weapons, the armor pieces uses the same color scheme to indicate the tier they belong to: those with names in orange are of the highest tier, followed by those in purple, blue, green and white (default). Hats are a unique class of armor in that each piece comes with a single distinct stat for defense, critical chance or speed. I also have the cyclone and the predator and the difference in movement between minigun and rifle is noticable. Anyway, I'll consider the Eastwood Hat last then. I would recomed the gorijla if u want a minigun, and what do you mean "seems to slow" the gorijla has 60% more bullets and more damage than the cyclops and if u mean slow of how fast a player moves, u move at the same speed with the gorijla and the cyclops. You should get the Eastwood Hat last since it has no assured visible effect. I now have the scorpion and apollon and quite satisfied except for the range of the scorpion so Im thinking of buying the cyclops (gojira seems so slow). On the other hand, Im also thinking of saving my crystals for the eastwood hat. Cyclops or eastwood hat, please help. I would say crossbow. It has been my all time favourite. It allows long ranged shooting and gives you the highest mobility in the toughest situations. But since the spiders show up in coop, I changed my other weapon from RPG to shotgun. It is hard to outrun the spiders but I can get some one-hit kills with the shotgun every time they try to get close. From my experience, the Eastwood Hat does not offer much observable benefit. You should buy it only if you want to maximize the critical chance. You can follow Kiloo Games' Twitter (twitter.com/kiloogames) or Simon Møller's Twiiter (twitter.com/simonmoeller) for more info.